The new water year, which started Oct. 1, has been very uneven with rain and snowfall. Stations are reporting 25-125% of normal totals. Since October, ocean and atmosphere indicators suggest we are in an “ENSO neutral” event where Pacific Northwest winters are near normal temperature and precipitation but highly variable daily weather. This means that the amount of spring snowmelt runoff will be near normal. The timing of the runoff could be earlier this year due to warmer than normal mountain temperatures. This runoff feeds the river flow which helps the fish migrate down the river and out to the ocean. North Pacific Ocean conditions are more favorable for salmon survival now due to enhance coastal upwelling. The figure (below) shows the current state of the region’s snowpack. The Cascade and Snake basins are running dry but the Upper Columbia is looking good. Current snow level is at 2500 feet. Several big storms are moving in now which are expected to build up more snowpack. 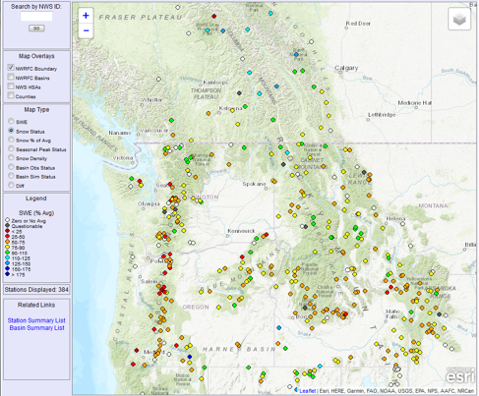 Snowpack, along with monthly and seasonal precipitation and current river flow, are the key components that are used to calculate the seasonal Water Supply Forecast. This forecast is used by water management agencies – U.S. Army Corps of Engineers, BPA, and the U.S. Bureau of Reclamation – to determine how much water is released for power, irrigation, and fish. The latest CRITFC water supply forecast: Columbia River at The Dalles is 95% of normal for the April-July runoff period. NOAA’s forecast is 87%.